North-South Lake Campground is the largest state campground in the Catskills. You'll find on many weekends that all 200+ campsites are full at this overly popular camping destination. The campground is ringed with many miles of hiking trails including the popular Escarpment Trail and the Long Path, make this a hikers paradise. You can find more information about this campground from the NY DEC website. A short walk of a 0.25 miles from the beach area will take hikers to the spectacular views from the site of the old Catskill Mountain House. Another short 0.2 mile walk on the Mary's Glen Trail will take you to Ashley Falls. Hikes on different sections of the Escarpment Trail will take hikers to many spectacular view points including Artist's Rock, Sunset Rock, Newman's Ledge, Boulder Rock and North Point to name a few. 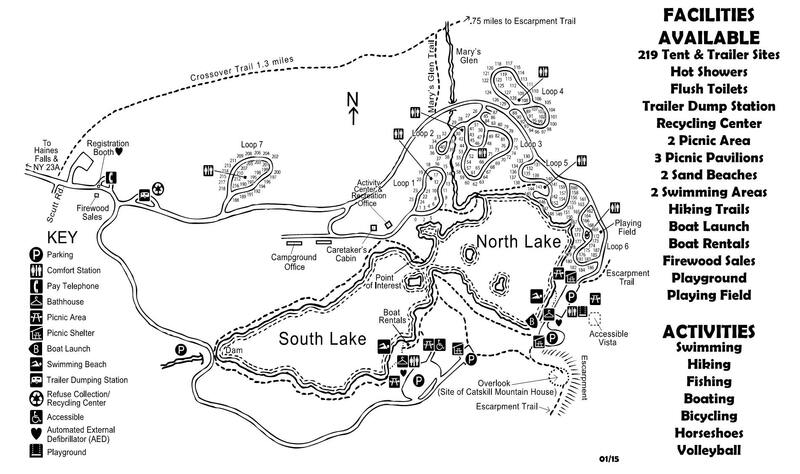 A very popular and easy hike at the campground is the 2.5 mile North-South Lake Loop, a pleasant hike around the "lakes". At one point there were two lakes here, however the land between the lakes was removed to create one large lake. Another popular hiking destination that is located near the campground is the spectacular Kaaterskill Falls. You can find pictures of each of the campsites from the CampsitePhotos.com website. Every effort has been made to make the information on this website as accurate and useful as possible. However, many things can change over time and can create discrepancies on the website. If you experience a discrepancy due to a change we have no control over, we apologize. Please let us know so we can update the website and others do not have the same experience! This website was meant as a guide to assist fellow outdoor enthusiasts choose and plan their hiking adventures. This website does not guarantee that all this information is 100% correct and can not guarantee your safety on the trails. You hike at your own risk and no one from this website is liable for any property loss or damage, personal injury, or any unfortunate death that may result from accessing or hiking any trails described on this website. Please be aware that hiking can result in injuries, sometimes serious. If your not careful on your hike or not properly prepared, it can be a matter of life or death in some instances.